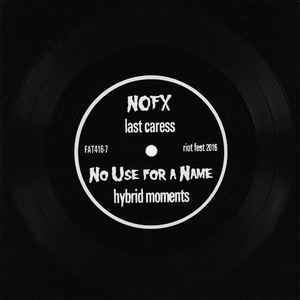 The NOFX / No Use For A Name split is a limited flexi that was included in the first 250 Riot Fest flexi packs of both Riot Fest Denver and Chicago. This special flexi features NOFX and No Use For A Name covering two songs of the original Misfits. Limited to 500 copies. A1 originally released on Various - Violent World - A Tribute To The Misfits and A2 on Various - The Return Of The Read Menace. Any fancy versions of the songs, or is it old studio versions?